CHEVY CHASE, Md. --The former president of Bolivia, who lives in exile in the United States, was sued Wednesday for allegedly overseeing the repression of protests in 2003 that left roughly 60 people dead and hundreds wounded. (left) Former Bolivian President Gonzalo Sanchez de Lozada in La Paz, in February 2003. The lawsuit against Gonzalo Sánchez de Lozada was filed in U.S. District Court on behalf of 10 Bolivians who had family members killed. They include relatives of an 8-year-old girl and a pregnant woman who were shot in their homes. The lawsuit seeks unspecified punitive and compensatory damages. A similar lawsuit was filed Wednesday in Miami against Sánchez de Lozada's former defense minister, José Sánchez Berzain. Both men fled Bolivia in 2003, with Sánchez de Lozada settling in the Washington suburb of Chevy Chase and Sánchez Berzain in Miami. The suits claim the men ordered the Bolivian military to violently quell protests over a new tax and plans to build a pipeline through Chile to export natural gas, one of Bolivia's largest natural resources. It alleges police and troops using machine guns and sharpshooters fired on demonstrators, most of them members of the Aymara indigenous group, during protests in Andean towns. The killings were ''part of a pattern and practice of systematic or widespread attacks and human rights violations'' by Sánchez de Lozada, according to the suit. The Center for Constitutional Rights filed the lawsuits along with other human rights lawyers. Jennie Green, a senior attorney for the center, said the victims were innocent bystanders. The suit seeks damages under the Alien Tort Claims Act, which Green said has been used successfully in civil human rights cases for alleged abuses that occurred abroad. ''The clients . . . want these former officials who escaped any form of accountability to be held accountable, to have some responsibility for what they did, to pay some penalty,'' she said. A phone message left at Sánchez de Lozada's home Wednesday was not returned. 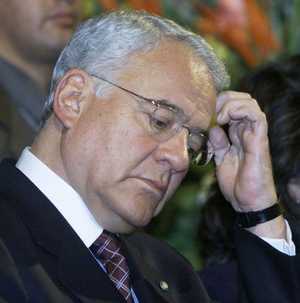 Mauricio Balcazar, who described himself as an advisor to Sánchez de Lozada, said the former president would not comment on the lawsuit. Balcazar said the case was politically motivated and accused the government of Bolivian President Evo Morales, who was a leader of the protests, of being behind the case to harass Sánchez de Lozada. Green denied any link to the Bolivian government. Sánchez de Lozada, 77, was educated in the United States before he returned to Bolivia and became a wealthy mining entrepreneur. He was first elected president in 1993 and later won a second term in 2002. In 2003, protests dubbed the Gas War erupted after the government proposed exporting natural gas through a port in Chile, a longtime Bolivian rival. Demonstrators blocked roads and eventually choked off supplies of gasoline and food to La Paz as they demanded Sánchez de Lozada's resignation. Balcazar said Sánchez de Lozada sent out troops to break the blockades and ensure the flow of supplies to La Paz. Soldiers only opened fire after convoys were ambushed, he said. ''This wasn't the army going out to shoot people,'' he said. Sánchez de Lozada resigned Oct. 17, 2003, and fled to the United States. Balcazar said Sánchez de Lozada has legal status in the U.S., but declined to comment further. The State Department did not return a call seeking comment.